The mechanisms of the protective effects of exendin-4 on NEFA-induced beta cell apoptosis were investigated. The effects of exendin-4 and palmitate were evaluated in human and murine islets, rat insulin-secreting INS-1E cells and murine glucagon-secreting alpha-TC1-6 cells. mRNA and protein expression/phosphorylation were measured by real-time RT-PCR and immunoblotting or immunofluorescence, respectively. Small interfering (si)RNAs for Ib1 and Gpr40 were used. Cell apoptosis was quantified by two independent assays. Insulin release was assessed with an insulin ELISA. Exposure of human and murine primary islets and INS-1E cells, but not alpha-TC1-6 cells, to exendin-4 inhibited phosphorylation of the stress kinases, c-Jun N-terminal kinase (JNK) and p38 mitogen-activated protein kinase (MAPK), and prevented apoptosis in response to palmitate. Exendin-4 increased the protein content of islet-brain 1 (IB1), an endogenous JNK blocker; however, siRNA-mediated reduction of IB1 did not impair the ability of exendin-4 to inhibit JNK and prevent apoptosis. Exendin-4 reduced G-protein-coupled receptor 40 (GPR40) expression and inhibited palmitate-induced phosphorylation of mitogen-activated kinase kinase (MKK)4 and MKK7. The effects of exendin-4 were abrogated in the presence of the protein kinase A (PKA) inhibitors, H89 and KT5720. Knockdown of GPR40, as well as use of a specific GPR40 antagonist, resulted in diminished palmitate-induced JNK and p38 MAPK phosphorylation and apoptosis. Furthermore, inhibition of JNK and p38 MAPK activity prevented palmitate-induced apoptosis. Exendin-4 counteracts the proapoptotic effects of palmitate in beta cells by reducing GPR40 expression and inhibiting MKK7- and MKK4-dependent phosphorylation of the stress kinases, JNK and p38 MAPK, in a PKA-dependent manner. Annalisa Natalicchio and Rossella Labarbuta contributed equally to this work. The online version of this article (doi: 10.1007/s00125-013-3028-4) contains peer-reviewed but unedited supplementary material, which is available to authorised users. NEFAs cooperate with other metabolic factors, as well as with hormonal and genetic abnormalities, to promote beta cell dysfunction leading to hyperglycaemia . If chronically in excess, saturated NEFAs can reduce insulin biosynthesis  and secretion  and induce beta cell apoptosis [4, 5], a phenomenon termed ‘lipotoxicity’. Therefore, improved knowledge of lipid signalling in the beta cell will allow a better understanding of the mechanisms of beta cell failure in diabetes and of the potential impact of therapeutic options on survival and secretory function of residual beta cells. Long-chain fatty acids are the natural ligands for the orphan, G-protein-coupled receptor 40 (GPR40), a member of a large family of proteins expressed preferentially in pancreatic beta cells . Several pathways have been proposed to mediate NEFA-induced apoptosis in beta cells, including activation of the stress kinases, c-Jun N-terminal protein kinase (JNK) and p38 mitogen-activated protein kinase (MAPK). Analogous to other MAPKs, JNKs are stimulated following the sequential activation of protein kinases, which include two dual-specificity MAPK kinases, MKK4 and MKK7, and multiple MAPK kinase kinases . While MKK7 is a specific activator of JNKs, MKK4 can also phosphorylate the Thr-Gly-Tyr motif of p38 MAPK . Activation of JNK and p38 MAPK is known to induce beta cell apoptosis ; however, the role of NEFA-mediated GPR40 activation in MKK/JNK signalling and beta cell death has not been clarified. Strategies targeted at enhancing insulin secretion while preserving beta cell mass are currently used or under development for type 2 diabetes treatment . These include glucagon-like peptide 1 (GLP-1) analogues, dipeptidyl peptidase-4 (DPP-4) inhibitors, GPR40 agonists and glucokinase activators [10, 11, 12]. DPP-4-resistant GLP-1 analogues, such as exendin-4, are characterised by a relatively long half-life while fully exploiting the insulinotropic effects of GLP-1 . Like other GLP-1 receptor agonists, exendin-4 exerts powerful prosurvival effects on pancreatic beta cells , and protects them against apoptosis induced by a variety of stimuli, such as NEFAs. However, the molecular mechanisms underlying the antiapoptotic effect of exendin-4 on NEFA-induced beta cell death are still poorly defined. Rat insulin-secreting INS-1E cells (passage 15–30; a gift from C.B. Wollheim, University of Geneva, Geneva, Switzerland) were grown as previously described . Murine glucagon-secreting alpha-TC1-6 cells (passage 35–40; a gift from Professor F. Purrello, University of Catania, Catania, Italy) were grown in monolayer at 37°C in a humidified incubator gassed with 5% CO2, in DMEM containing 4 mmol/l l-glutamine supplemented with 0.02% BSA, 3 g/l glucose, 10% heat-inactivated FBS, 100 IU/ml penicillin, 100 μg/ml streptomycin, 0.1 mmol/l non-essential amino acids (all from Gibco Invitrogen, Paisley, UK) and 15 mmol/l HEPES (pH 7.4). Wild-type C57Bl/6 mice were purchased from Charles River Laboratories (Calco, Italy). All animal experimentation respected the regulations and guidelines of Italy and the European Union and the NIH Principles of Laboratory Animal Care (NIH, publication no. 85-23, revised 1985). All the experiments with mice described in this paper have been evaluated and approved (internal ID 0907) by the ethics committee ‘Comitato Etico per la Sperimentazione Animale’ (CESA) of IRSG, Biogem. Mouse islets were isolated by bile duct perfusion and collagenase digestion as described . After isolation, they were cultured free floating in RPMI culture medium (Gibco Invitrogen) at 5.5 mmol/l glucose concentration and studied within 3 days of isolation. Cell viability, measured by Trypan Blue exclusion, was 90% after 3 days in culture. Human islets were isolated and cultured as previously described , after approval by the local ethics committee of the University of Pisa. INS-1E cells and islets were pretreated with or without 10 nmol/l exendin-4 (exenatide, from Eli Lilly and Co, Indianapolis, IN, USA) for 16 h, followed by stimulation with 0.5 mmol/l palmitate (Sigma-Aldrich, St Louis, MO, USA). Palmitate was dissolved in 0.1 mmol/l NaOH at 70°C for 30 min, and 5 mmol/l palmitate was complexed with 10% essentially fatty acid-free BSA (NEFA/BSA molar ratio of 3.3:1). As indicated, cells were preincubated with SP600125 (10 μmol/l) for 2 h or with the JNK inhibitor, D-JNKi peptide (10 μg/ml), for 16 h. D-JNKi linked to an FITC fluorochrome (D-JNKi-FITC) was used to visualise cell entry and accumulation. Cells were preincubated with SB203580 (40 μmol/l) or SB202190 (10 μmol/l) for 30 min, or with the GPR40 antagonist, GW1100 (1 μmol/l; from Calbiochem, Darmstadt, Germany), for 30 min before treatment with palmitate. Cells were preincubated with H89 (5 μmol/l) for 30 min or KT5720 (1 μmol/l) for 60 min before treatment with exendin-4. In other experiments, cells were stimulated with the GPR40 agonist II (10 μmol/l; from Calbiochem) for 1 h. The JNK inhibitor, JNK-I peptide linked to a 5(6)-carboxyfluorescein (5(6)-FAM) fluorochrome, was from PRIMM (Milan, Italy). SB202190 and KT5720 were from Sigma-Aldrich. All other inhibitors were provided by Calbiochem. INS-1E cells were seeded on six-well plates. Upon reaching ∼70% confluence, cells were cultured in growth medium without antibiotics, and after 24 h they were transiently transfected with 60 nmol/l small interfering (si)RNA Gpr40 (also known as Ffar1) (SASI Rn01 00056248 RA NM 153304; Sigma-Aldrich) or siRNA Ib1 (also known as Mapk8ip1) (5′-AACAGCGATGGATTGACCAG-3′) using Lipofectamine 2000 (6 μl/well; Gibco Invitrogen) according to the manufacturer’s instructions. siRNA transfection of murine islets was performed as previously described , using dispersed islet cells and 60 nmol/l siRNA Gpr40 (SASI_Mm 01_00102368; Sigma-Aldrich) with Lipofectamine 2000. Lipofectamine 2000 only (Mock) and scrambled siRNA (5′-CGGAAGCGUGUUAACGCAUAU-3′; SCR-siRNA) controls were carried out in parallel. Cells were lysed in buffer containing 50 mmol/l HEPES, pH 7.5, 150 mmol/l NaCl, 1 mmol/l MgCl2, 1 mmol/l CaCl2, 4 mmol/l EDTA, 1% Triton X-100, 10% glycerol, 50 mmol/l NaF and 10 mmol/l sodium pyrophosphate, supplemented with 100 μmol/l phenylmethylsulfonyl fluoride, 5 ng/ml leupeptin, 1 μg/ml aprotinin and 2 mmol/l Na3VO4. Equal protein samples (60 μg) from the cell lysates were separated by SDS-PAGE (7% or 10% gels), as appropriate, and analysed by immunoblotting as previously described . For immunofluorescence studies, equal amounts of size-matched islets (400 islets/each experimental condition) were dissociated with 3 mmol/l EGTA, 20 mg/ml BSA, 2.8 mmol/l glucose and 0.83 μg/ml trypsin to obtain single-cell suspensions. Human beta cells and INS-1E cells were seeded in poly-d-lysine-coated glass coverslips (Esco-Erie Scientific, Portsmouth, NH, USA) and cultured for 24 h in complete medium. To examine JNK phosphorylation, INS-1E cells and human pancreatic beta cells were fixed in ice-cold 4% paraformaldehyde for 15 min. Permeabilisation was achieved in TRIS-buffered saline (TBS)/0.2% Triton X-100 for 10 min; after two washes with TBS/0.1% Triton X-100, cells were exposed to a primary polyclonal antibody against phosphorylated JNK (1:500 dilution) in TBS/3% BSA at 4°C overnight, and then cells were incubated with a secondary Alexa Fluor 546 anti-rabbit goat antibody (1:1,000 dilution; Molecular Probes, Eugene, OR, USA) for 1 h at 25°C. To visualise nuclei, INS-1E cells and human beta cells were stained with TO-PRO-3 (1:5,000 dilution; Molecular Probes). Pictures were acquired on a Leica TCS SP2 laser scanning spectral confocal microscope (Leica Microsystems, Heerbrugg, Switzerland). Total RNA was isolated using RNeasy Mini Kit (Qiagen, Hilden, Germany). Genomic DNA contamination was eliminated by DNase digestion (Qiagen), and 500 ng total RNA was used for cDNA synthesis using the High Capacity cDNA Reverse Transcription Kit (Applied Biosystems, Weiterstadt, Germany). Primers were designed using Primer Express 3.0 (Applied Biosystems) (electronic supplementary material [ESM] Table 1). The PCRs were carried out in an ABI PRISM 7500 System (Applied Biosystems) under the following conditions: 50°C for 2 min, 95°C for 10 min, 40 cycles at 95°C for 15 s, and 60°C for 1 min. Relative RNA levels were determined by analysing the changes in SYBR green fluorescence during PCR using the ΔΔCt method. The mRNA level of each gene was normalised using Gusb. Apoptosis was measured using the Cell Death Detection ELISAPLUS kit (Roche Biochemicals, Indianapolis, IN, USA), according to the manufacturer’s instructions. Isolated mouse islets were seeded into 250 ml RPMI-1640 medium with 11.1 mmol/l glucose in 48-well dishes at eight islets/well. After preincubation in KRB containing 3.3 mmol/l glucose for 1 h, the islets were treated for 1 h in KRB containing the indicated reagents with low (3.3 mmol/l) or stimulatory (25 mmol/l) glucose concentrations. The supernatant fractions were then obtained from each reaction well and frozen at −70°C for subsequent determination of insulin concentrations using an insulin ELISA kit (Millipore, Bedford, MA, USA). Polyclonal antibodies against phosphorylated Thr183/Tyr185-JNK and total JNK, phosphorylated Ser63-c-Jun and total c-Jun, phosphorylated Thr180/Tyr182-p38 MAPK and total p38 MAPK, phosphorylated Ser271/Thr275-MKK7 and total MKK7, phosphorylated Ser257/Thr261-MKK4 and total MKK4, phosphorylated Ser133-cAMP-response-element-binding protein (CREB) and total CREB or cleaved caspase-3 (Asp175) were purchased from Cell Signaling Technology (Beverly, MA, USA). Mouse monoclonal antibody against islet-brain 1/JNK interacting protein 1 (IB1) was from BD Transduction Laboratories (Lexington, KT, USA). Polyclonal GPR40 and glyceraldehyde-3-phosphate dehydrogenase (GAPDH) antibodies were from Santa Cruz Biotechnology (Santa Cruz, CA, USA). All data are presented as mean ± SEM and were analysed by Student’s t test or ANOVA, followed by the Tukey multiple comparison test, where appropriate. Statistical significance was set at p < 0.05. To investigate NEFA-induced cell death and its potential prevention by the GLP-1 receptor agonist exendin-4, human and murine pancreatic islets were exposed to palmitate for up to 48 h. Apoptosis was found to be increased between 2.5- and 3.5-fold by palmitate, and this was evident after 16–24 h of exposure to the fatty acid (p < 0.05 vs basal; Fig. 1a, b). Challenge of human and murine islets with palmitate also resulted in a two- to three-fold increase in phosphorylation of the stress kinases, JNK (p < 0.05; Fig. 1c–e) and p38 MAPK (p < 0.05; Fig. 1d, e). However, when both human and murine pancreatic islets were pretreated with exendin-4 (10 nmol/l) for 16 h, palmitate-induced apoptosis was markedly reduced (p < 0.05 vs palmitate-exposed islets; Fig. 1a, b). In addition, exendin-4 almost abrogated the increase in JNK (Fig. 1c–e) and p38 MAPK (Fig. 1d, e) phosphorylation in response to palmitate (p < 0.05 vs islets not pretreated with exendin-4). A similar ability of exendin-4 to prevent palmitate-induced apoptosis (evaluated with two independent assays; Fig. 2a, b) and phosphorylation of JNK (Fig. 2c, d) and p38 MAPK (Fig. 2e) was observed in the rat insulin-secreting cell line, INS-1E. The effects of non-saturated fatty acids capable of activating GPR40 were also investigated. Apoptosis was found to be increased ∼1.5-fold in oleate-treated INS-1E cells, and pretreatment with exendin-4 (10 nmol/l) for 16 h completely inhibited oleate-induced apoptosis (p < 0.05 vs palmitate-exposed cells; ESM Fig. 1a, b). A demonstration that activation of both JNK and p38 MAPK is involved in the apoptotic effect of palmitate was achieved in murine pancreatic islets and INS-1 cells, respectively. Inhibition of JNK phosphorylation and activity using the SP600125 inhibitor (10 μmol/l) (ESM Fig. 2a, c) largely prevented palmitate-induced apoptosis (p < 0.05 vs control; Fig. 3a, ESM Fig. 3a). Palmitate-induced apoptosis was also reduced by ∼50% in the presence of SB203580 (40 μmol/l) (p < 0.05 vs control; Fig. 3b, ESM Fig. 3b), a specific p38 MAPK inhibitor (ESM Fig. 2b, d). Similar results were obtained using additional chemical inhibitors of JNK (i.e. the specific JNK inhibitor peptide, JNKi, 10 μg/ml) or p38 MAPK (i.e. SB202190, 10 μmol/l) (ESM Fig. 4a–d). Furthermore, when murine pancreatic islets and INS-1E cells were pretreated with both JNK and p38 MAPK inhibitors, the apoptotic effect of palmitate was completely abrogated (p < 0.05; Fig. 3c, ESM Fig. 3c). To evaluate the possibility that excess saturated fatty acids could also promote apoptosis of alpha cells, similar studies were carried out in the glucagon-secreting alpha-TC1-6 cell line. Exposure of alpha-TC1-6 cells to palmitate for up 48 h resulted in a time-dependent increase in JNK phosphorylation and cellular apoptosis (Fig. 4a, b); however, in contrast with beta cells, exendin-4 did not inhibit these effects of palmitate in pancreatic alpha cells (Fig. 4c–e). Since exendin-4 reduced palmitate-induced JNK and p38 MAPK phosphorylation, the possibility that GLP-1 receptor activation could regulate the expression levels of GPR40, which serves as a major cell-surface receptor for palmitate , was investigated. Exposure of human islets to exendin-4 for up to 24 h reduced GPR40 mRNA and GPR40 protein levels by 50% (p < 0.05 vs basal; Fig. 5a, b). A similar ability of exendin-4 to reduce GPR40 protein expression was observed also in murine islets and INS-1E cells (p < 0.05 vs basal; Fig. 5c–e). In contrast, treatment of INS-1E cells with palmitate for up to 48 h did not affect Gpr40 mRNA levels (data not shown). The physiological significance of exendin-4-induced reduction of GPR40 expression was investigated next using both a GPR40 agonist/antagonist approach and a specific siRNA to reduce GPR40 protein expression. Treatment of murine islets with the GPR40 agonist II (10 μmol/l for 1 h) or exendin-4 (10 nmol/l for 16 h) resulted in enhanced GSIS by ∼30–50% (p < 0.05 vs control; ESM Fig. 5a). Furthermore, pretreatment of islets with exendin-4 for 16 h and subsequent challenge with the GPR40 agonist II for 1 h resulted in a similar augmentation of GSIS (ESM Fig. 5a), indicating that the effects of exendin-4 and the GPR40 agonist were not additive. However, exposure of both murine islets and INS-1E cells to the GPR40 agonist II for longer times (i.e. up to 48 h) provoked an increase in cellular apoptosis by 1.8-fold (p < 0.05 vs basal; Fig. 6a, ESM Fig. 6a, b), albeit the magnitude of this response was lower than the palmitate-induced apoptosis (p < 0.05; Fig. 6a, b). Pretreatment of murine islets with exendin-4 for 4 h did not inhibit the apoptotic response to palmitate or GPR40 agonist II, while this effect was observed when exendin-4 was used for longer times (i.e. for 16 h and 24 h) (Fig. 6a), in parallel with the inhibition of GPR40 expression (Fig. 5c). Furthermore, a specific GPR40 antagonist (GW1100; 1 μmol/l), which neutralised the ability of GPR40 agonist II to enhance GSIS in murine pancreatic islets (ESM Fig. 5b), inhibited GPR40 agonist II- and palmitate-induced apoptosis by >90% and 50%, respectively (Fig. 6b). An RNA interference strategy was also used to selectively suppress Gpr40 expression and determine the resulting effects on palmitate-induced apoptosis. Murine islets and confluent INS-1E cells transfected with an siRNA sequence targeting Gpr40 showed a 65% reduction in the GPR40 protein levels (p < 0.05; ESM Fig. 7a, b). Under these conditions, palmitate-induced apoptosis was inhibited by ∼50% (p < 0.05 vs control; Fig. 6c, ESM Fig. 7c), and so was the activation of the stress kinases, JNK and p38 MAPK (p < 0.05 vs control; Fig. 6d, e; ESM Fig. 7d, e). Altogether, these findings indicate that GPR40 conveys a proapoptotic signal that can be activated when beta cells are exposed to palmitate. IB1, a scaffold protein that tethers components of the JNK pathway acting as an endogenous blocker, has been suggested to mediate the protective actions of exendin-4 against apoptosis elicited by the cytokine, IL-1β . Therefore, IB1 was next studied in the context of exendin-4 inhibition of NEFA-induced apoptosis. Indeed, when INS-1E cells were exposed to palmitate for up to 48 h, IB1 protein content was initially increased and then reduced starting at 24 h (p < 0.05; ESM Fig. 8; and data not shown); in addition, exendin-4 treatment for 16 h increased IB1 protein content both in the absence and presence of palmitate (p < 0.05; ESM Fig. 8a). However, when a specific siRNA was used to selectively reduce IB1 protein levels (p < 0.05; ESM Fig. 8b), the ability of exendin-4 to increase IB1 expression was prevented (p < 0.05; ESM Fig. 8b), and yet the ability of exendin-4 to inhibit palmitate-stimulated JNK activity, evaluated by measuring c-Jun phosphorylation, was unaltered (p < 0.05; ESM Fig. 8c). It is noteworthy that, when Ib1 was silenced, the ability of exendin-4 to abrogate palmitate-triggered apoptosis of INS-1E cells was also fully preserved (ESM Fig. 8d). Thus, albeit palmitate and exendin-4 exert apparently opposite effects on IB1 protein expression in INS-1E cells, changes in IB1 protein levels do not seem to mediate the ability of exendin-4 to prevent palmitate-induced apoptosis. On the other hand, exendin-4 inhibited palmitate-induced phosphorylation of the kinases, MKK4 and MKK7, which are involved in JNK and p38 MAPK activation (p < 0.05 vs palmitate-treated INS-1E cells; ESM Fig. 9a, b), indicating that the GLP-1 analogue may exert inhibitory effects on the JNK signalling pathway upstream of IB1. GLP-1 effects on beta cell growth and survival are largely mediated by activation of the cAMP/protein kinase A (PKA)/CREB signalling pathway . We have previously shown that exposure of INS-1E cells to exendin-4 for up to 24 h induced significant increases in intracellular cAMP concentrations and CREB phosphorylation . When cells were pretreated with two independent PKA inhibitors, H89 (5 μmol/l) and KT5720 (1 μmol/l), exendin-4-induced CREB phosphorylation was abrogated (ESM Fig. 10a, b), and the ability of the GLP-1 receptor agonist to reduce Gpr40 mRNA and GPR40 protein levels was also prevented (p < 0.05 vs exendin-4-treated cells; Fig. 7a, b; and data not shown). In addition, inhibition of PKA prevented the ability of exendin-4 to suppress palmitate-stimulated cellular apoptosis (p < 0.05 vs basal; Fig. 7c), as well as MKK4, MKK7, JNK and p38 MAPK phosphorylation (p < 0.05 vs basal; ESM Fig. 11a–d). Thus, exendin-4 counteracts the palmitate effects on beta cell apoptosis by reducing GPR40 protein expression and by inhibiting MKK7- and MKK4-dependent phosphorylation of JNK and p38 MAPK in a PKA-dependent manner. This study was designed to identify the mechanisms of the protective effects of GLP-1 mimetics on NEFA-induced beta cell death. The degree of saturation of the fatty acids seems to be important for the cytotoxic effect [4, 21, 22], and thus in this study the saturated NEFA, palmitic acid, one of the most abundant fatty acids in plasma, was used. We show that exposure of isolated human and murine pancreatic islets and cultured insulinoma cell lines to palmitate promotes apoptosis by activating JNK and p38 MAPK signalling, and that pretreatment of beta cells with the GLP-1 receptor agonist, exendin-4, prevents the proapoptotic effects of palmitate by multiple mechanisms, including reduction of GPR40 expression and inhibition of MKK4/MKK7-dependent JNK and p38 MAPK activation. The effects of exendin-4 were apparently specific for beta cells, since they were not observed in glucagon-secreting alpha-TC1-6 cells, in which palmitate also induced JNK signalling and apoptosis. These findings may reflect the low level of GLP-1 receptor expression in alpha-TC1-6 cells (A. Natalicchio and F. Giorgino, unpublished results) . GPR40 is highly expressed in pancreatic beta cells and insulin-secreting cell lines, is activated by NEFAs, and plays an important role in the chain of events linking hyperinsulinaemia, obesity and type 2 diabetes [24, 25]. Consistent with its role in glucose-dependent insulin secretion, activation of GPR40 has recently been exploited as a therapeutic target for treatment of type 2 diabetes . However, mice lacking GPR40 display significant protection from obesity-induced hyperglycaemia , and overexpression of GPR40 in beta cells results in impaired beta cell function and diabetes . A possible explanation for these apparently divergent effects of GPR40 on beta cell function could be related to the timing of exposure of the receptor to NEFAs, with short-term exposure resulting in increased insulin secretion and long-term exposure leading to beta cell dysfunction, respectively. In this study, exposure of both murine islets and INS-1E cells to a specific GPR40 agonist for several hours resulted in increased apoptosis (ESM Fig. 6), even though the magnitude of this response was lower compared with palmitate-induced cell death (Fig. 6). In contrast, short-term GPR40 stimulation resulted in enhanced GSIS (ESM Fig. 5). Furthermore, results with both a GPR40 antagonist and a specific Gpr40 siRNA indicated that beta cell death induced by long-term exposure to palmitate results, at least in part, from activation of GPR40 (Fig. 6, ESM Fig. 7). In line with these findings, other studies have demonstrated that inhibition of GPR40 protects beta cells from apoptosis [26, 27]. In addition, apoptosis induced by a GPR40-dependent mechanism was also demonstrated in other cellular systems . However, other investigators have recently claimed a protective role of GPR40 in beta cell survival, showing increased beta cell death after treatment with a GPR40 antagonist but unexpectedly no effect when a GPR40 agonist was used . The reasons for these discrepancies are unknown at present and probably reflect different signalling properties of the individual GPR40-binding molecules. Interestingly, the effects of the GPR40 agonist and exendin-4 on insulin release were not additive (ESM Fig. 5), probably because of exendin-4-mediated inhibition of GPR40 expression (Fig. 5). Exposure of cells to NEFAs results in increased intracellular calcium concentrations and phosphorylation of members of the MAPK family. Two MAPK kinases (MKK4 and MKK7) reportedly phosphorylate and activate the stress kinase, JNK [30, 31]. While MKK7 is a specific activator of JNK, MKK4 can also phosphorylate the Thr-Gly-Tyr motif of p38 MAPK. In this study, the ability of exendin-4 to promote beta cell survival against palmitate was shown to involve an inhibitory effect on palmitate-induced MKK4/MKK7-mediated JNK and p38 MAPK activation. GPR40 knockdown reduced, but did not abolish, palmitate-induced JNK and p38 MAPK phosphorylation and apoptosis; similarly, blocking GPR40 with a specific GPR40 antagonist partially inhibited palmitate-induced apoptosis (Fig. 6, ESM Fig. 7). In contrast, pretreatment with exendin-4 completely prevented JNK and p38 MAPK activation in response to palmitate (Figs 1 and 2). Since GPR40 protein levels were similarly reduced in Gpr40 siRNA- and exendin-4-treated beta cells, it is likely that the effects of exendin-4 on inhibition of the MKK4/MKK7 signalling cascade are, at least in part, independent of the reduction in GPR40 protein expression. The involvement of other NEFA-dependent signals in the promotion of beta cell dysfunction and death has also been proposed. These include activation of Erk-1/2 , NF-κB , protein-kinase C (PKC)-δ , endoplasmic reticulum (ER) stress , calpain-10  and ceramide formation , and induction of sterol regulatory element-binding protein , macrophage migration inhibitory factor , cell death-inducing DNA fragmentation factor a-like effector A  and cell death-inducing DFF45-like effector b . NEFA-mediated inhibition of Akt activity  has also been implicated. In this study, beta cell apoptosis was fully suppressed when both JNK and p38 MAPK protein activities were inhibited (Fig. 3 and ESM Fig. 3). It is likely that inhibition of JNK/p38 MAPK activities would also reduce serine phosphorylation of IRS-1 and IRS-2, as previously reported in TNF-α-treated beta cells in response to exendin-4 ; thus, albeit other pathways may be involved in NEFA-mediated rodent and human beta cell death, activation of the stress kinases, JNK and p38 MAPK, appears to represent a key signalling node in this process. 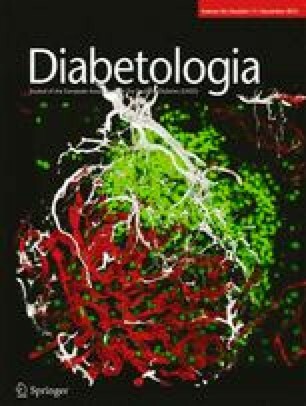 Administration of GLP-1 was associated with proliferative and antiapoptotic effects in both endocrine and exocrine compartments of the pancreas [43, 44], and significantly reduced apoptotic beta cells in experimental diabetes models . GLP-1 receptor agonists can inhibit the proapoptotic pathways triggered by a variety of stimuli, including IL-1β, TNF-α and rapamycin, by interfering with JNK and possibly p38 MAPK activation [15, 19, 46]. The cAMP/PKA/CREB cascade represents a central mechanism of GLP-1 action, specifically when this relates to promotion of beta cell survival , even though other signalling mediators may also be implicated [48, 49]. Impairment of CREB-mediated transcription led to loss of islets by apoptosis and diminished the antiapoptotic action of exendin-4 in human islets . In line with these results, our previous studies demonstrated that inhibition of TNF-α-induced JNK phosphorylation by exendin-4 was abrogated when cells were preincubated with H89, a specific inhibitor of PKA . Also in this study, the antiapoptotic action of exendin-4 was significantly reversed by two specific PKA inhibitors, H89 and KT5720. Furthermore, PKA activation was found to be involved in exendin-4-induced GPR40 inhibition and suppression of MKK4/MKK7 signalling. In future studies, it will be important to decipher the mechanism by which PKA regulates GPR40 expression possibly at the level of gene transcription. This work was supported by a grant from the Ministero dell’Università e della Ricerca, Italy, to FG. FG is a consultant for and has received lecture fees from Eli Lilly & Co, AstraZeneca and Bristol-Myers Squibb. FG has received grant support from Eli Lilly, AstraZeneca and Bristol-Myers Squibb. All other authors declare that there is no duality of interest associated with their contribution to this manuscript. AN, RL and FG designed the study. FT, GB, EC and PM acquired data. RL, NM and GB performed experiments and data analysis. AN, RL, LL, SP and FG performed data analysis and interpretation. AC, AP, MRO and AL participated in interpretation and discussion of the data. AN, RL and FG wrote the manuscript. PM, LL, SP, FT, GB, NM, AP, EC, MRO, AL and AC critically reviewed the manuscript for intellectual content. All authors approved the final version of the manuscript.